SAILKARMA.COM - Sailing News, Videos and Photos! : Iceberg Ahead! Roaring winds and treacherous waves are what spring to mind when one thinks about dangers at sea… But for the round-the-world ocean racer, another enemy lurks in the dark grey, desolate waters of the Southern Ocean – the risk of collision with drifting ice increases dramatically as boats reach deeper in the high latitudes of the Southern Hemisphere. 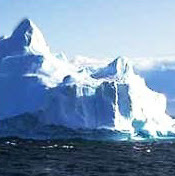 Hence the need for the Barcelona World Race organizers to set up ice gates ensuring a safer course around the planet. Today, when Sébastien Josse recalls what happened on the 23rd of December 2004, the memory still sends shivers down his spine: “I went from 12 knots right down to a full stop,” he said that day, right after the incident. “It was violent,” Josse continued, “Nothing gave any indication of ice ahead, and I would have had to be out on deck to see it.” The French skipper, racing in the 2004 Vendée Globe, had just collided with a ‘growler’ the size of a massive piece of furniture. The bow of his VMI IMOCA Open 60 was seriously damaged, which prevented him from hoisting his big foresails for the rest of his race… but it could have been much worse. One can only shake with fear at the perspective of the same encounter, blasting downwind at 25 knots of boatspeed. Three days before Sébastien’s collision, the New Zealand Coastguard had informed the Vendée Race Direction Team of the presence of fifteen huge icebergs located roughly 300 miles east of Campbell Island – precisely in the area where Vincent Riou and Jean Le Cam were sailing. Riou subsequently altered his course to avoid the minefield, while Le Cam sent regular updates and observations. Most alarmingly, among the blocks that were spotted, one was about the quarter of the size of Groix Island (off Lorient) – remember the estimation was made by a Breton sailor! – which amounts to about three square miles.